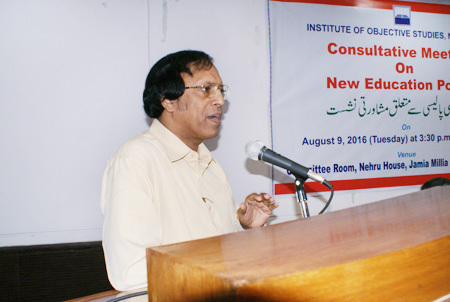 The Institute of Objective Studies organised a Consultative Meeting on New Education Policy on August 9, 2016 at Nehru House, Jamia Millia Islamia. 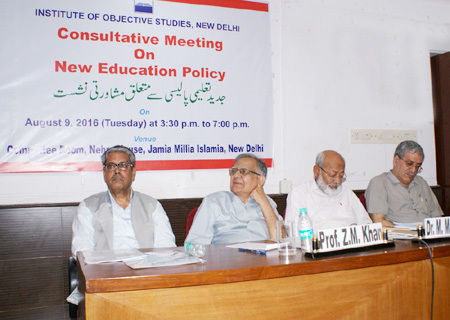 Initiating the discussion, the Secretary General, IOS, Prof. ZM Khan, highlighted the main points in the new education policy and said that the Preamble to the Indian Constitution spoke of secularism which could only be achieved through the process of secularisation. Education was a means of socialisation, though it had always been a state subject. Basic education required a lot of thinking as that was the very foundation on which the development of the faculties of children rested. He explained that higher education did not require much to be done as the students in higher portals of knowledge were left to fend for themselves. But what constituted a threat to education was the nationalist agenda of right-wingers who, if not stopped, would inflict an irreparable damage on our polity. He said that the IOS was engaged in debating issues like education and social backwardness of the marginalised sections. 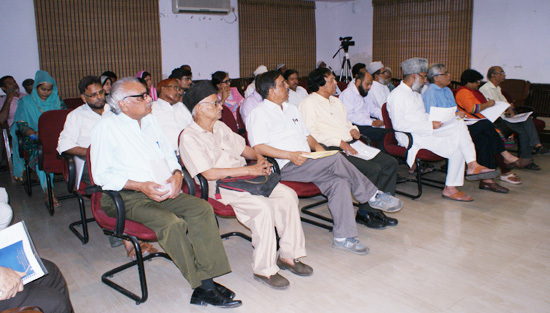 The Institute had also taken care of regional identities and aspirations of people by undertaking their case studies. He said that the silver lining in an atmosphere of despondency was that the people in general were very tolerant. The Vice-Chancellor of the Indira Gandhi National Open University (IGNOU), Prof. M. Aslam, opined that the new education policy was not accessible to the majority of children. Besides, the quality of education was lacking. And an element of employability had been added to the proposed education policy. He warned that the information communication technology revolution had come to stay, leaving children at the mercy of IT. What was needed was a vision for the new education policy in order to make it more inclusive. Holding training of teachers as an important component of education, he said that the new education policy had not attached much importance to it. We must move ahead only after creating a vision for education that could be made available to all segments of society. He also pleaded for making optimum utilisation of open and distance learning. Emphasising the need for more and more schools for the education of Muslim minorities, he said that they must is made productive members of society. Referring to the Sachar Committee Report, he said that the main reason behind the backwardness of Muslims was lack of proper education among them. He asked the community leaders to take serious note of an army of unemployed that had been produced by unproductive education. 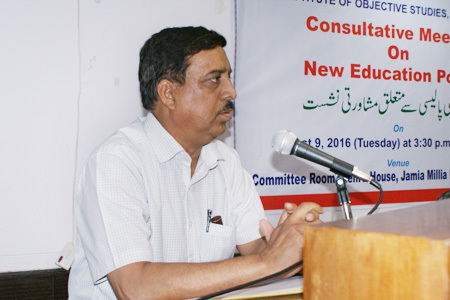 Prof. Shoaib Abdullah of the Faculty of Education, JMI, held that the new education policy was found wanting on several counts. While the Kothari Commission Report was comprehensive, the proposed education policy did not clearly spell out the purpose of education. All previous education policies had sections like education of women and girl child, but the current policy lacked it. Similarly, no separate sections on Scheduled Castes and Muslims had been provided. The new education policy eclipsed the role of the government in the standardisation and spread of education in keeping with the changing times. The new policy was destined to lead to fall in the standard of education. Introduction of skill development and employability at such a tender age was a retrograde step. The new education policy, he said, was aimed at outsourcing in which the private sector would be the main player. Thus education was being made subservient to the industry, he added. 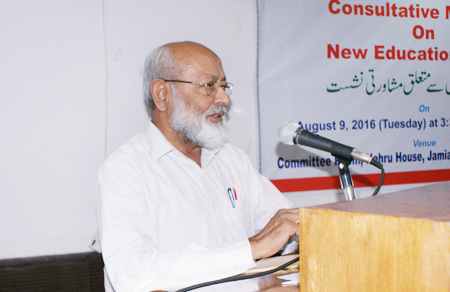 Founder-director of the Institute of Harmony and Peace Studies, Dr. MD Thomas expressed concern that the new education policy did not address real concerns of life. It was not based on ground realities nor did it teach something serious. He said that education should conform to the values that formed part of the Preamble to the Constitution. Education was the collaborative effort of all communities, he noted. 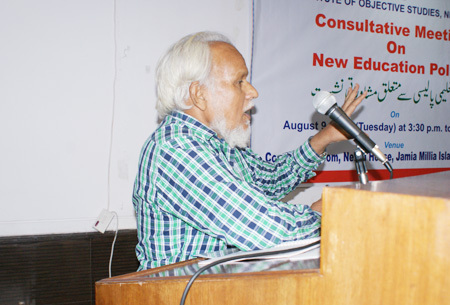 National convener of the RTE Forum, Ambarish Rai, held that the new education policy was the third such policy after 1966. Commenting of the Kothari Commission Report, he said that it was all-pervading as it laid stress on national integration, which was so vital for the country’s unity and integrity. He favoured a public-funded education system in which the government would have to play the socialisation role. Referring to the second education policy which was rolled out in 1986, he said that the period during the end of the eighties and beginning of the nineties saw a big bang in Indian economy. The second education policy which was reviewed in 1992, contained common school system and had provision for special groups. In 1993 the Supreme Court of India asked the government to provide education to the children who attained of age 14 years. This finally led to the legal entitlement to education by way of the enactment of the Right to Education. The new law, he said, came into effect on April 1, 2010. Terming the new education policy as futile since it was completely detached from society, he observed that such education failed to provide equal opportunities to all. Painting a grim picture of education, he said that education was not meant for providing only employment. In that respect the new education policy had faultlines. He took the government to task for making half-hearted commitment to education. While India did not have enough funds for education, the budget earmarked for it too was not fully utilised. Though the new education policy was unveiled in 2013, nothing substantial could come out till today. He regretted that the rate of drop-outs after class 8 had gone up to 60 per cent. The new education policy was feared to create a child-labour pool. This policy also negated the contribution of minorities to our national ethos. Education was something greater than mere legal entitlement. Under the new education policy, teachers were supposed to do everything except the work related to education. He said that multinational companies were being invited to take part in a three trillion dollar education business. Nearly 92 percent of teachers would be trained by the private sector. Almost one lakh government schools had closed and unless political mobilisation was made, more and more schools in rural areas would face closure. This had been necessitated by the merger of small schools with large ones. He warned that if the government withdrew from the scene schools run for the minorities and the Scheduled Castes would close as foreign companies were coming to construct low-cost schools. 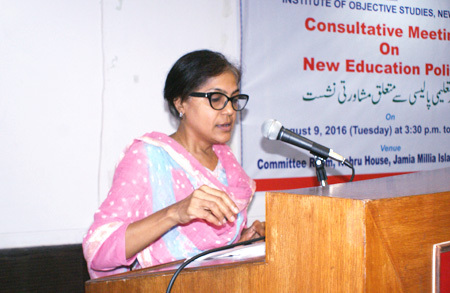 Naaz Khair, an independent education activist, observed that the new education policy was IT-based. From teaching to governance and management, everything would be done by the IT, minimising, or rather ending the manual work. Commenting on the new education policy, she said that it focused on life skills, vocational skills and employability. This was preparatory to create a market economy in the education sector. She suggested that composite schools be opened in the areas dominated by tribals for better schooling of their children. Under the proposed policy, she said, teachers would play the role of a facilitator only. New education policy started with the references of Patanjali, Aryabhatta, Charaka, Sushrta, etc. and suddenly came down to Gopal Krishna Gokhale, Pandit Madan Mohan Malaviya and Mahatma Gandhi. In the policy, there was much stress on the teaching of Sanskrit and yoga. She pointed out that the new education policy was not inclusive. 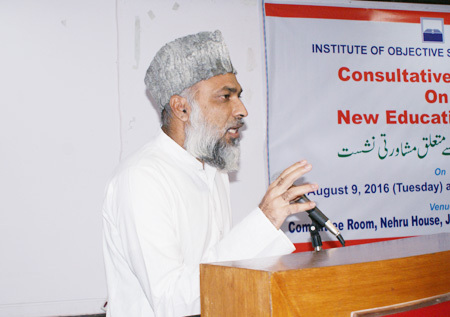 The Secretary, Jamat-i-Islami Hind, Maulana Naeem Falahi, expressed concern that the coaching institutions, schools run and managed by multinational corporations and Saraswati Shishu Mandirs had mushroomed of late. The government had hastily drafted the new education policy which did not reflect true aspirations of the people. The ruling party at the Centre wanted the people to accept a particular ideology reflected in yoga, surya namaskar and Sanskrit. He said that the new policy was against our culture and identity. It saffronised the minds of our children on one hand and sent them to schools run by multinationals on the other, he added. Assistant Prof., Deptt. 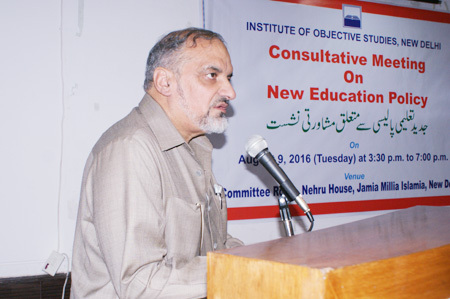 of Education, JMI, Dr. Muzammil Husain Qasmi, alleged that the new education policy was being made market-friendly. This would make matters worse, especially for girl students, 90 to 100 percent of whom desisted from going to school located in another village. While madarsa education had been omitted, IT found a place in it. He opined that the IT-driven programmes would fail the very purpose of education. President, Tasmia Educational Society, Syed Farooque held that education had three components – art of expression, art of earning and the art of living. Unless all these three components were joined together, the very purpose of education was doomed to failure. Educational institutions should impart education without regard to caste and creed. Religion must not be used to discriminate against people, he said. 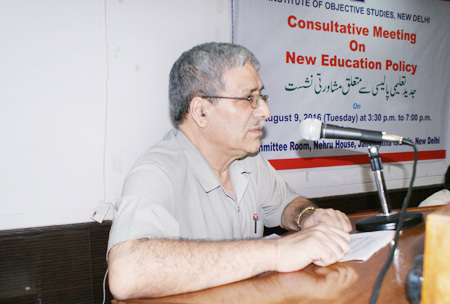 The Chairman of the IOS, Dr. Mohammad Manzoor Alam, in his presidential remarks announced the setting up of a three-member committee comprising Secretary General, IOS, Prof. ZM Khan, Vice-Chancellor of the Indira Gandhi National Open University (IGNOU), Prof. M. Aslam, and National Convener of the RTE Forum, Ambarish Rai to take the suggestions from stakeholders till August 11 and meet on August 12 next to incorporate them in the representation to be forwarded to the Union Minister for Human Resource Development for consideration. He informed that all the Members of Parliament belonging to secular parties would be sent copies of the suggestions in order to sensitise them on the educational plight of the minorities and other deprived sections of society. He regretted the tendency among MPs to first endorse such suggestions at individual level but take the party line later. He also announced that four large programmes, each in a big city in the north, south, east and west, would be organised in which young men, school teachers and intellectuals would be invited to participate and deliberate on the threat posed by the new education policy. He said that besides minds, pens needed to come together to give shape to new ideas. He warned that the present government might interfere with the Preamble to the Constitution by unilaterally foisting the new education policy. Earlier, the meeting began after the recitation of a Quranic verse by Hafiz Nazeerul Hasan. Dr Nakhat Husain Nadvi conducted the proceedings. The meeting was attended by a good number of academicians, social activists, university teachers and prominent citizens.